We offer a variety of birch and red oak spindles. 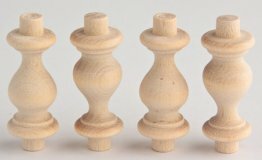 Our birch spindles are available in convenient hobby packs. All of our spindles are available in bulk packs.